We offer the ECCE scheme to children who qualify. 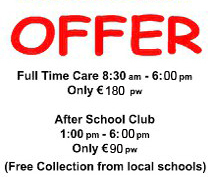 Our opening hours are 8.30am to 12.15pm at a cost of €100 per month (ECCE fee excluded). we find that children make the transition with little or no discomfort. to develop a good self image. 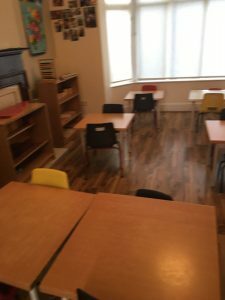 Children are free to roam the room and are not confined to desks and there are no time constraints on how a long a child works on a chosen activity. 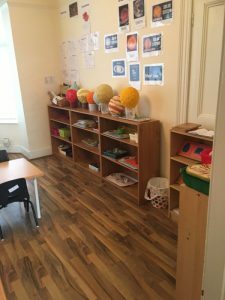 A wide selection of materials and activities nourish self-confidence etc The classroom includes areas of Practical Life, Sensorial Exercises, Mathematics, and Language Development. We offer Stretch n’ Grow , art and crafts classes, music, and drama are integrated into the classroom activities. 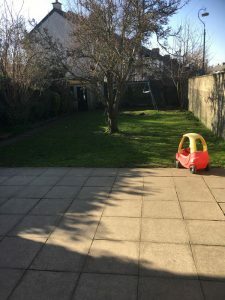 We also have a very safe and secure back garden for children to get out and get some fresh air everyday.